Sam is designed to understand a lot about you, what you like and what you need to ensure that every step of your journey runs smoothly. Download the app now to get a feel for what Sam can do for you! By organising your travel plans and using data from a number of sources Sam can send you up-to-date, practical information based on context, relevance and individual preference, Sam will help enhance your travel experience. Leaving you to focus purely on your destination. From pre-trip information, such as letting you know your destination weather to help you pack, to organising your airport transfers and letting you know where to collect your bags on arrival, you’ll find Sam really helpful. Sam will alert you based on up to date travel information to ensure you don’t miss your connection. But if you do need to change things, Sam will help schedule you onto the best option, all within your company travel policy. Want to call a local taxi, or get a city guide with helpful tips and restaurant recommendations? Sam can do that too. Sam is always on, so you don’t have to be. How does Sam do it? The power of technology is changing the very nature of corporate travel. Sam blends a mix of the latest AI (Artifical Intelligence) with FCM consultant expertise. The result? A powerful combination of data and functionality, assisting a traveller every step of the way. With a little bit of ‘Sam’ personality added on top. 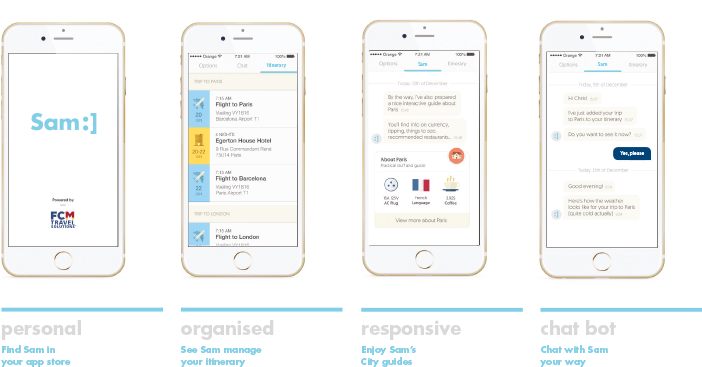 Download the app now to get a taster of what Sam can offer. FCM customers can get the enhanced version with advanced features such as automatically synced travel plans, live chat with travel consultants, integrated expense and duty of care features, booking functionality and much, much more. Speak to us now to find out how to get this. Join the fastest growing community of empowered corporate travellers. Simply get in touch with FCM Travel Solutions to book your free demo today. FCM Travel Solutions is one of the world’s leading corporate travel management providers. Our objective is simple: to provide you with better travel ideas for greater savings.